Beatrice Giustolisi is a post-doc researcher at the Department of Psychology of the University of Milano-Bicocca. 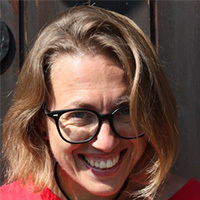 She is involved in the SIGN-HUB Project, working on the development of tools of Italian Sign Language (LIS) assessment. She received her PhD in Psychology, Linguistics and Cognitive Neuroscience at the University of Milano-Bicocca in February 2018, co-supervised by Carlo Cecchetto and Maria Teresa Guasti. She holds a M.A. in Linguistics from the University of Padua and a M.Sc. in Cognitive Science from the University of Trento. She is interested in language acquisition in deaf children, both signers and non-signers. She is also interested in the relation between language and other cognitive processes, and how using languages in different modalities modulates this relationship.